5:00 p.m. - 11:59 p.m. 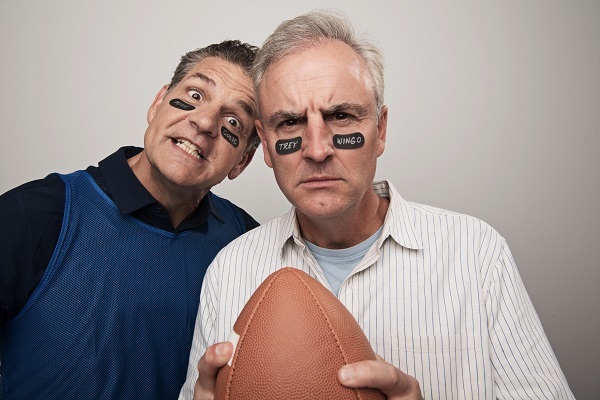 Mornings have changed on 103.3 FM ESPN as Mike Golic and Trey Wingo wake up Dallas-Fort Worth every weekday from 5am-9pm. Join Mike and Trey as they entertain you on your commute and at work and bring you the biggest newsmakers, entertainers, and insiders right to your speaker. Listen on air, online at kesn1033.com or on the ESPN Dallas Radio App. Mike Golic is the co-host of ESPN Radio’s new weekday morning drive show, Golic and Wingo, alongside Trey Wingo and Mike Golic Jr. Golic formerly co-hosted the long-running Mike & Mike, on which he partnered with Mike Greenberg for nearly 18 years. Golic joined ESPN in 1995 as an NFL studio analyst on NFL 2Night and later joined NFL Live – where he and Wingo worked together in 2003 when it debuted. He was also a color commentator for the Arena Football League (1996-98, 2007-08) and ESPN/ABC college football games until the mid-nineties. He is a nine-year NFL veteran, who played defensive tackle for the Houston Oilers, Philadelphia Eagles and Miami Dolphins. He is also a member of the National Association of Broadcasters Broadcasting Hall of Fame, as part of the 2016 class with his Mike & Mike co-host, Greenberg. A National Radio Hall of Fame nomination (2017). As part of Mike & Mike, Golic and Greenberg also appeared as “guest conductors” at Wrigley Field, leading Cubs fans in singing “Take Me Out to the Ball Game” multiple times; announced and played in Legends Game at Yankees Stadium in 2008 and St. Louis in 2009; and appeared in two motion pictures with Greenberg, Valentine’s Day and Just Wright, among other opportunities. Born December 12, 1962, Golic is a 1985 graduate of the University of Notre Dame where he served as captain of the football team during his senior season and wrestled. Golic is married with three children. Trey Wingo, who joined ESPN in November 1997, is co-host of ESPN Radio’s new Golic and Wingo morning drive show and one of the primary figures in ESPN’s year-round coverage of the National Football League. He continues to serve as a host of ESPN’s NFL Live, as well as the company’s presentation of the NFL Draft and the annual Pro Football Hall of Fame enshrinement ceremony. On November 27, 2017, Wingo and Mike Golic – along with contributing co-host Mike Golic Jr. — premiered Golic and Wingo on ESPN Radio and ESPN2. The show reunited Wingo with his longtime friend and colleague Golic, whom he worked with early in his ESPN career on the pro football studio show NFL 2Night. Wingo has hosted NFL Live since its inception in 2003. He has anchored ESPN’s long-running highlight show NFL PrimeTime since 2007, and he hosted NFL Insiders: Sunday Edition for two seasons (2015-16). A prominent figure in ESPN’s many tent-pole NFL events throughout the year, Wingo has anchored SportsCenter specials during Super Bowl and NFL Draft coverage. He has also hosted ESPN’s NFL Draft telecast and annual Pro Football Hall of Fame enshrinement ceremonies (since 2004), and he conducts the SportsCenter post-game interview with the Super Bowl MVP. During the football offseason, Wingo contributes to grand slam tennis coverage at Wimbledon and the US Open. In recent years, he also covered U.S. Open golf and The Open as part of his on-air responsibilities. Wingo previously hosted The NFL on ESPN Radio, a day-long update, interview and analysis program on NFL Sundays (2001-03). Before assuming his television role on the NFL Draft, Wingo hosted the ESPN Radio broadcast of the event and contributed a six-hour chat on ESPN.com in 2000. In 2007, he handled play-by-play for Arena Football games. Wingo previously anchored ESPN’s NCAA Women’s Basketball Tournament studio coverage, including the Final Four and Selection Show. He has also hosted SportsCenter, Baseball Tonight, and ESPN2’s NFL 2Night and NBA 2Night shows and made regular appearances on ESPN Radio with weekly commentaries and periodic work on GameNight and GameDay. A key contributor to ESPN’s digital media platforms, Wingo hosted the Subway Fresh Take video podcast and anchored segments for ESPN’s local web sites and ESPN Mobile TV. He also participated annually in ESPN The Weekend, a sports-themed special event featuring ESPN commentators and star athletes at Walt Disney World Resort in Orlando from 2005-11. Wingo joined ESPN as an anchor for ESPNEWS from KSDK-TV in St. Louis, Mo., where he was a sports anchor/reporter for six years (1991-97). Prior to that, he was a sports anchor/reporter for WFMZ-TV in Allentown, Pa., for a year and the sports director at WMGC-TV in Binghamton, N.Y. (1988-90). He also served for a year in a similar position at Binghamton’s WICZ-TV. Wingo began his career in 1987 as a sports producer for NBC’s News at Sunrise in New York. A native of Greenwich, Conn., Wingo was graduated from Baylor University in 1985 with a bachelor’s degree in communications. He won six Mid-America regional Emmy awards for reporting, including three straight years for outstanding sports reporting. He remains active in a variety of causes, including the Prostate Cancer Foundation’s Athletes for a Cure campaign, The V Foundation for Cancer Research and Special Olympics.